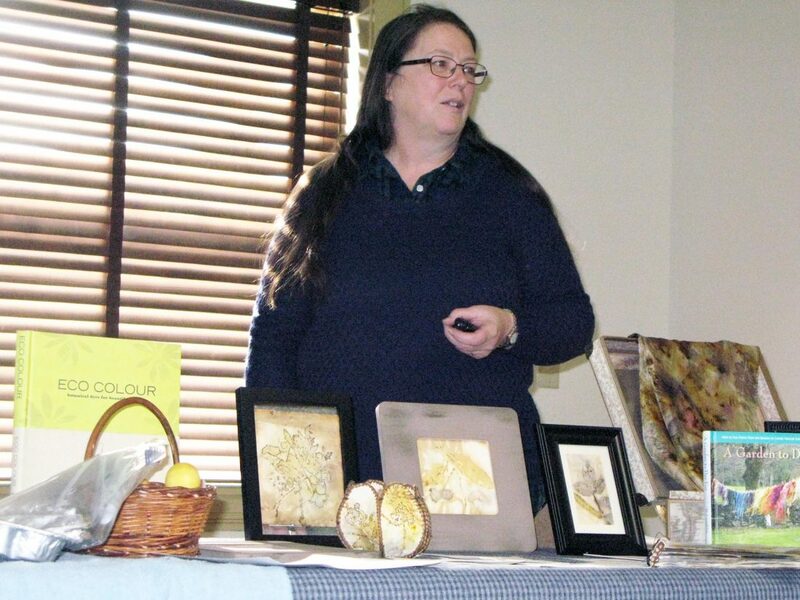 That was the title of a presentation by local gardener Poppy Hatinger, who talked about the art of eco-printing on Saturday at the Peter White Public Library. 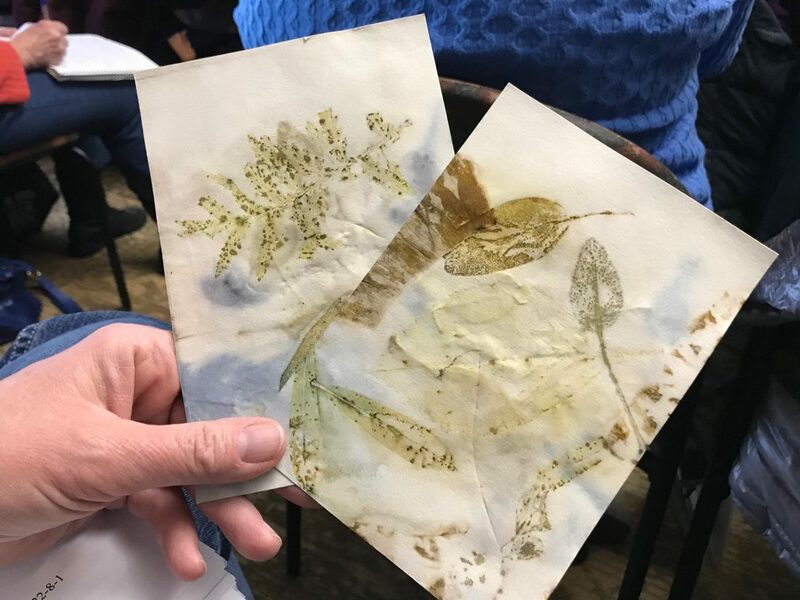 “It’s that combination of interests and gardening and artwork that brought her to the eco-prints,” said Ron Rossway, president of the Upper Peninsula Master Gardener Association, which hosted the talk. Hatinger, also a maker of willow basketry, gave a simple explanation of the process: adding color, pattern and texture to a substrate. 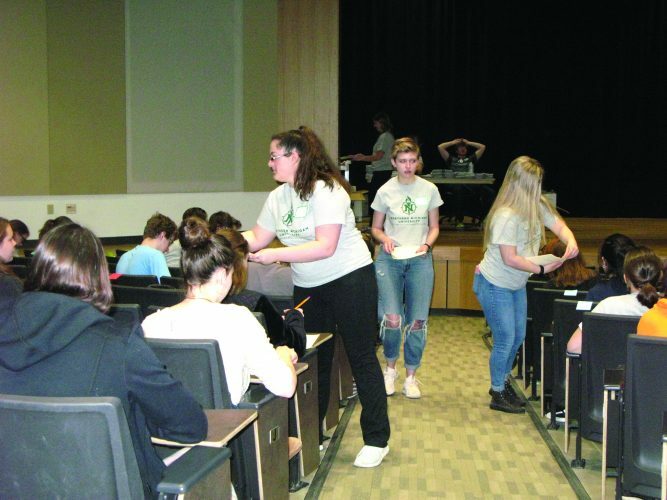 “It’s contact printing, and it’s done in an environmentally friendly manner,” Hatinger said. Eco-printing could be enjoyed by a variety of people. Judging from her finished products, though, many people wouldn’t suspect she’s not a professionally trained artist. She did acknowledge falling into another eco-printing demographic. Hatinger said that in this method, a person pounds a flower petal into fabric, ironing it to help set it. “It’s not going to last forever, but it lasts for many years,” she said. Flowers that work well in petal-pounding, she noted, include johnny jump-ups, pansies and red geraniums. 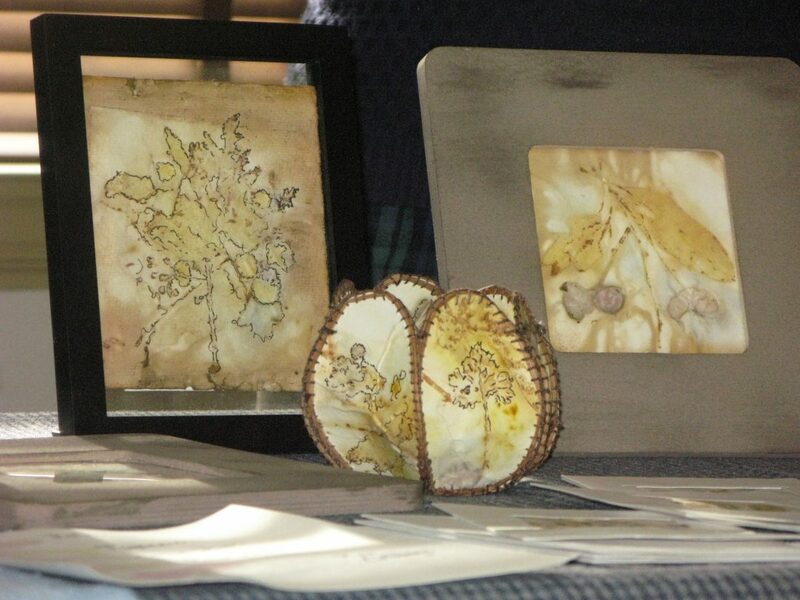 Hatinger also uses steaming bundles and watercolor paper to eco-print. “That’s where I sort of stepped out of my comfort zone and started to experiment,” she said. This method involves placing wrapped bundles containing plants in a steamer, placing the steamer on a hot plate or stove, turning up the temperature and steaming for up to two hours, adding more water if needed. As with many pastimes, keeping records helps. Records could include the name of the plant, date, material collected, process, dye vessel, mordant and remarks. Lovers of yellow could plant goldenrod or marigolds, and for people who prefer red, madder root is a good suggestion. Coreopsis and orange cosmos are good plants to grow to get orange, while mulberries and pokeberries are suitable for purple. To get a blue-dyed product, grow woad or dyers knotweed, and to get a green hue, try black-eyed susans or pink cosmos. Black is even a possibility, with smoke tree and sumacs proper choices. Resources for people wanting to try eco-printing include: “Eco Colour: Botanical Dyes for Beautiful Textiles” by India Flint, “A Garden to Dye For” by Chris McLaughlin and an e-book titled “Plant Poetry” by Louise Upshall. 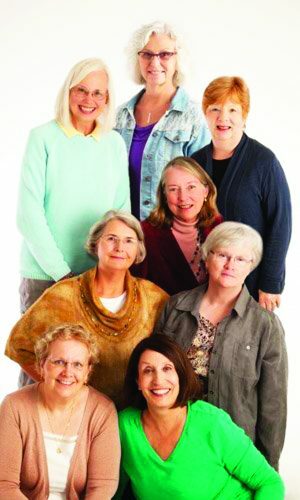 Membership in the Upper Peninsula Master Gardener Association is open to anyone who enjoys gardening. The organization has field trips and garden tours, develops gardening conferences and live monthly educational presentations, and helps with funding for master gardener projects, among other activities. The $25 annual fee covers membership from Jan. 1 to Dec. 31. 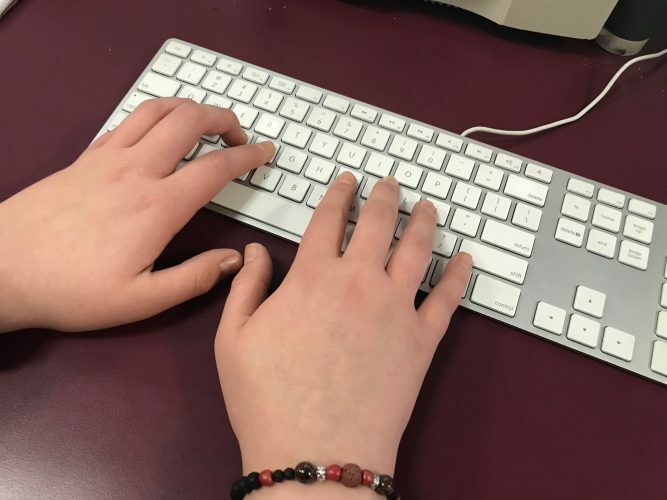 A form listing name, address, phone and email plus a check payable to UPMGA may be mailed to Linda Andriacchi, 1500 Aspen Drive, Ishpeming, MI 49849. For more information on the association, visit UPMGA.com, or email rrossway@gmail.com or linda.andriacchi@gmail.com.